Edvard Munch’s 1895 classic masterpiece painting entitled “The Scream” became the most expensive artwork ever sold at auction when it was bought for nearly $120 million at Sotheby’s in May 2012. Munch, the Norwegian painter and printmaker, made four versions of “The Scream”: three paintings (1893, 1895 and 1910) and one lithograph (1895). “The Scream” is Munch’s most famous work and probably one of the most recognizable paintings of all time. It has been widely interpreted as representing the universal anxiety of modern man, a universal symbol of angst and existential dread. Painted with broad bands of garish color and highly simplified forms, it depicts a hairless figure on a bridge under a brilliant yellow-orange sky in the throes of an emotional crisis, exploring the themes of love, angst and death. Munch referred to the painting as the study of his own self. Munch wrote of how the painting came to be: “I was walking down the road with two friends when the sun set; suddenly, the sky turned as red as blood. I stopped and leaned against the fence, feeling unspeakably tired. Tongues of fire and blood stretched over the bluish black fjord. My friends went on walking, while I lagged behind, shivering with fear. Then I heard the enormous, infinite scream of nature.” Years later, he went on to describe the personal anguish behind the painting, “for several years I was almost mad… you know my picture, ‘The Scream?’ I was stretched to the limit—nature was screaming in my blood… after that I gave up hope ever of being able to love again.” It paints quite a sad and disturbing personal tale. Three versions of “The Scream” are in Norwegian museums. This version, the most colourful of the four found in the United States, is the only “Scream” still in private hands and has apparently never before been shown publicly in New York. It also differs from the other three versions as it has a frame painted by the artist with a poem describing a walk at sunset (“I felt a whiff of melancholy — I stood still, deathly tired”) that inspired the work. It is also unique among the “Screams” as the background figure is turning to look out onto the cityscape. This version of “The Scream” will go on view at the Museum of Modern Art, New York, for six months, starting on October 24th, courtesy of its new mystery owner. The New York financier Leon Black is said to have been the buyer of the painting at Sotheby’s, but nobody, including Mr Black himself, would confirm that this was the case. 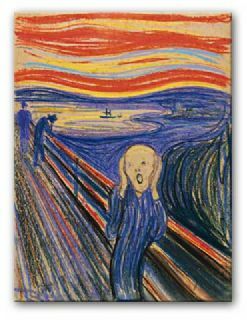 Inevitably, security at the museum will be extremely strict as versions of “The Scream” have been stolen twice before. First in 1994, when two burglars fled the National Gallery of Norway in Oslo with an 1893 “Scream” and then in 2004 when masked gunmen stole the 1910 version, as well as Munch’s “Madonna,” from the Munch Museum, also in Oslo. Both works were recovered two years later. You can buy a reproduction Edvard Munch The Scream print from Modern Canvas Art. It costs a lot less than $120 million.